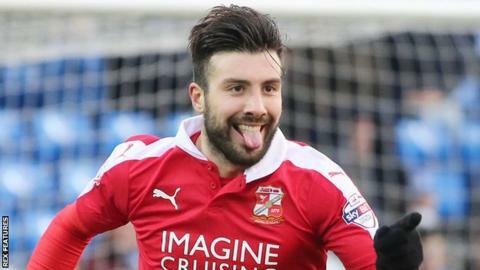 Michael Doughty bounced back from conceding an early penalty to score a late goal and help Swindon Town beat Peterborough United. Doughty brought down Marcus Maddison, who converted from the spot to give Posh a 12th-minute lead. Nicky Ajose levelled for the visitors with his 20th goal of the season with a fine free-kick that had Posh keeper Stu Moore well beaten on his debut in goal. Late on, Doughty struck a left-footed shot to seal three points for Swindon. Moore went straight into the Peterborough side after signing on a 28-day loan deal from Reading, but could not stop Posh losing a fourth-straight game. Graham Westley's side slip to 15th in the League One table, while Swindon move up three places to 12th following the victory. Hand ball by Leonardo Da Silva Lopes (Peterborough United). Corner, Swindon Town. Conceded by Gabriel Zakuani. Attempt blocked. Jeremy Balmy (Swindon Town) right footed shot from the left side of the box is blocked. Attempt saved. Michael Smith (Peterborough United) right footed shot from the centre of the box is saved in the top centre of the goal. Harry Toffolo (Peterborough United) is shown the yellow card. Attempt blocked. Shaquile Coulthirst (Peterborough United) right footed shot from the centre of the box is blocked. Foul by Jeremy Balmy (Swindon Town). Goal! Peterborough United 1, Swindon Town 2. Michael Doughty (Swindon Town) left footed shot from the centre of the box to the bottom right corner. Corner, Peterborough United. Conceded by Nathan Thompson. Delay in match Jordan Turnbull (Swindon Town) because of an injury. Attempt missed. Tom Nichols (Peterborough United) left footed shot from the centre of the box is close, but misses to the left. Substitution, Swindon Town. Jeremy Balmy replaces Fabien Robert. Attempt missed. Martin Samuelsen (Peterborough United) right footed shot from the centre of the box is just a bit too high. Attempt blocked. Marcus Maddison (Peterborough United) left footed shot from the centre of the box is blocked. Attempt saved. Shaquile Coulthirst (Peterborough United) right footed shot from a difficult angle on the left is saved in the bottom left corner. Corner, Peterborough United. Conceded by Brandon Ormonde-Ottewill. Attempt blocked. Harry Beautyman (Peterborough United) right footed shot from the centre of the box is blocked. Corner, Swindon Town. Conceded by Leonardo Da Silva Lopes. Attempt blocked. Nicky Ajose (Swindon Town) right footed shot from the left side of the box is blocked. Foul by Tom Nichols (Peterborough United). Substitution, Swindon Town. Anton Rodgers replaces Louis Thompson. Attempt missed. Jonathan Obika (Swindon Town) left footed shot from the right side of the box is close, but misses to the left. Substitution, Peterborough United. Tom Nichols replaces Souleymane Coulibaly. Attempt saved. Nicky Ajose (Swindon Town) right footed shot from outside the box is saved in the top right corner.